Description of "Interpreting Democracy (eBook)"
'Interpreting Democracy', containing two chapters 'Politics of the Insentient' and 'Justiciary of the Injudicious', is a layman's glimpse into the character and behavior of democratic dispensation of the nation, and tends to offer a logical considered view to upgrade provisions thereof in true meaning and scope of the word democracy, and judiciousness of governance. Ram Lal Garg, post-graduate from Punjab University, worked as a banker for 35 years before taking up writing as pastime. He has since written three fictional books, and 'Interpreting Democracy' is his first non-fiction work. 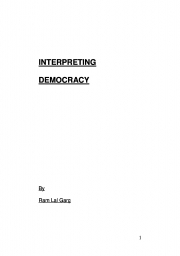 Reviews of "Interpreting Democracy (eBook)"